Delafield, WI, January 21, 2019 — Flora Elements Education and Floral Studio opened its doors to the Delafield community and beyond. Flora Elements is a Florist offering modern floral designs, custom bridal bouquets, and wedding arrangements to local Lake Country, Waukesha, Pewaukee and Brookfiled. 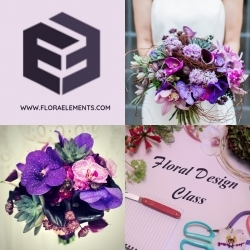 Their main purpose is education – they offer a certification Floral Design Class, but also many fun classes for those who are not florists and just need to relax and play with flowers.